It's time to "Fill the Cookie Jar"! This month, Cynthia challenged the group to bring our best holiday cookies. So, today I bring to you Sour Cream Cookies! My mom and I have been baking these cookies as long as I can remember. The recipe is in an old church cookbook that is slowly loosing it's binding... I do wish there was a way to get it put back together with some some new spiral binding! It is my go to cookbook for so many recipes. Like this one! This dough is so soft, it's like working with a "pillow" of cookie dough. It really is a dream to work with. The cookies are very soft, with soft lines. I love how my snowflake cookies turn out with this recipe. Depending on the size and shape of your cookies, this can be a lot of cookies, so I often cut the recipe in half. ***12/3/17***Update. Making cookies today, and it's unseasonably warm outside, so it is quite warm in the house as well. And humid do to all the cooking I am doing. This resulted in a very sticky cookie dough. If this ever happens to you, add additional flour, 1/4 cup at a time until it is workable and not so sticky. Divide dough into two balls. On floured surface, roll dough out to between 1/8" and 1/4" thick, and cut with cookie cutter. Place on lined cookie sheets. Bake for 10 minutes or just until a hint of golden-ness around the edges. Cool on sheet 3-4 minutes, then transfer to cooling rack. Cool completely. Frost with your choice of frosting, and enjoy with as many of your favorite sprinkles as you like! yummy! i love sugar cookies. Kris, these are beautiful, and they sound delicious!! I LOVE baking with sour cream- I bet these cookies just melt in your mouth. The way you decorated them is perfect- these would definitely stand out on a cookie tray!! Yum. I was looking for a new, diff kind of Christmas cookie! And a great excuse to stock up on sour cream one of my weaknesses! Yum! These look like the perfect cookie. I bet they're so moist with the sour cream. I have never made sour cream cookies, but I can imagine they are great. I love soft cookies, so these sound like they are right up my alley! 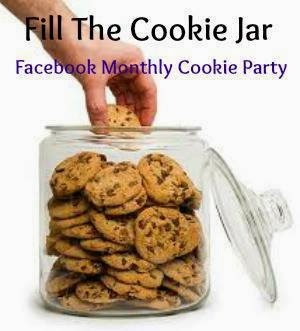 Thanks so much for being a part of the Fill The Cookie Jar facebook group! Yum! Thank you for sharing! I trade with my friend who HATES to bake (she is a photographer and does our Christmas cards every year) and make her all her cookies! These will be on our list this year!!! I've never used sour cream in a cookie, these sound delicious. With this recipe these would be perfect for a cookie exchange. I have a recipe similar to this one in a cookbook, and I have often considered making them, but always seem to fall back on the usual. Now I am going to have to try them. Wow! This sounds delicious. Thank you for sharing. I have talked to a couple family members that have made this recipe, and it really is all over the place based on size of cookie and thickness of dough, but for a ball park number, 5 to 6 dozen. OK They are amazing I just made them and omg they are SUPER SOFT!! Also, I made a bunch of approx. 2 and a 1/2" stars got almost 60! and that is out of half the dough! I will never lose this recipe!!! The dough seems very soft, I don't think it can be rolled if not chilled first, thoughts ? Marla ~ It is a very soft dough! If it is to sticky, add a bit more flour, but I wouldn't let the softness scare you. I have always been amazed at the softness, pillowy like marshmallows. Your cookies look delightful! I love soft cookies like these. And the snowflake shape is just perfect for them. These sound great, lovely idea. These sugar cookies look so good! Thank you for the recipe! I meant to say sour cream cookies, not sugar cookies - sorry! My Grandmother used to make sour cream cookies and I loved them! Unfortunately I didn't get the recipe so thank you! I will certainly try these out! Can you substitute butter for the shortening? Judy ~ I have never tried that. It would likely change the flavor and texture, but I would think you would still have a good cookie. I am such a cookie monster - I'd woof down half a dozen of these lovelies in no time flat. =) Thanks a million for sharing them with us at Weekend Potluck. These got our attention at Weekend Potluck and are being featured this week. Way to go! Keep sharing. And enjoy a wonderfully blessed Merry Christmas! These look and sound great. Would love the recipe for the frosting. I'm not real fond of store bought frosting. These look and sound so great! Would love the recipe for the frosting; I'm not fond of any store-bought frosting. Lisa ~ I really go in the moment when decorating cookies and don't follow a recipe. I did find this one for you which would be really similar to what I do for my glaze. Just be sure to add the water a little at a time so that it doesn't get to thin for you. OK. So, where's the glaze recipe you found, please? Just sending you a quick note you know that your Sour Cream Cookies Recipe is a FINALIST in the Merry ThanksChristmas Recipe Contest! Be sure to check it out. And, good luck in the final voting. Winners will be announced on November 15th. What pretty and delicious cookies! I love a nice soft cookie so you are speaking my language!